Expires 10/31/2014, Dinner only. Not valid during lunch hours. Not valid towards the purchase of alcohol. Not valid with any other offer. Enjoy $50 worth of upscale global cuisine for just $33 at La Riviera in Bryan! These make great gifts! The price you pay does not show on the voucher. 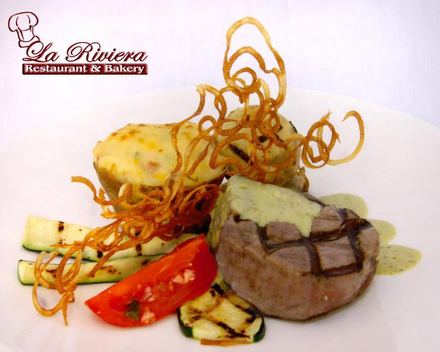 La Riviera Restaurant is an upscale white-tablecloth restaurant serving continental cuisine featuring traditional and new dishes from France, Italy and Latin-America. The patisserie is one of the best, with pastry chefs who produces amazing desserts locals rave about. La Riviera is located on the corner of S. Texas Ave and E. North Ave.